Notorious is a brush script typeface created by Andrés Vega and published by W Foundry which was inspired by calligraphy gestural. It is avaiable in 4 styles, useful Open Type features (Uppercase Alternates, Swashes, Ligatures and final letters.) With a natural look is perfect for the detyail you’re looking for … Similar to White Oleander, the Notorious handmade font is ideal for headline, logo, packaging, branding etc. 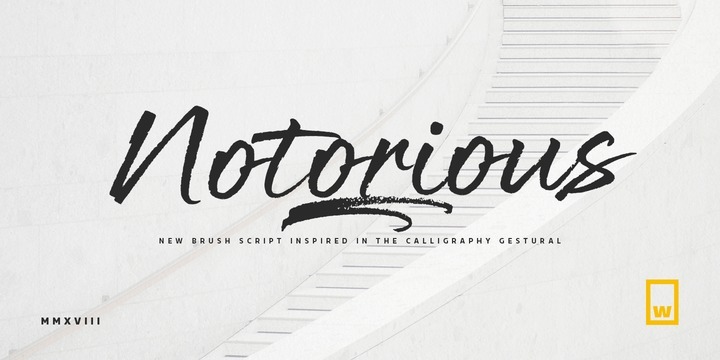 Get notorious designs with Notorious font! A font description published on Wednesday, February 7th, 2018 in Andrés Vega, Fonts, W Foundry by Alexandra that has 1,105 views.